I'm not sure how there can be an absence of time when one is essentially out doing nothing, but there is. The more nothing we do, the less time we have to do it, I haven't even finished yesterday's quota yet. 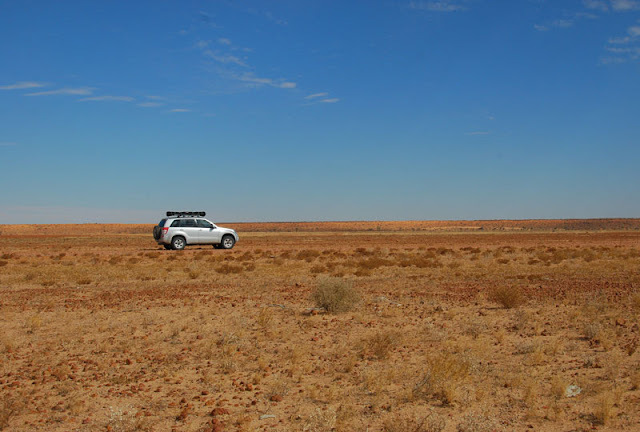 The photo was taken on the edge of the Simpson Desert near Birdsville, but we are now in Boulia, with a couple of thousand kilometres worth of adventure under our tyres and no time to update anything. Tomorrow we're out of communication again for three days as we poke down the "highway" to Alice Springs. Nothing broken, no flat tyres ... so far. I'm glad to hear you're enjoying yourself, while I'm working super hard. Don't worry about the time flying, every day that passes is a day closer to the home of barbeque chicken!